366 pages | 10 Color Illus. Leonard Sowerby's self-healing manual for women, The Ladies' Dispensatory, emerged in England in 1652 amidst an abundance of medical self-help books for the lay citizen. Written for both the common patient and the amateur health provider, these manuals of home remedies provided their readers with a variety of potential solutions to common ailments or disease. Sowerby's Dispensatory was written primarily for curing women's health problems, and in that regard, focuses heavily on gynecologic problems (the Dispensatory includes numerous preparations for inducing abortion), breast complaints, personal hygiene and cosmetic applications. 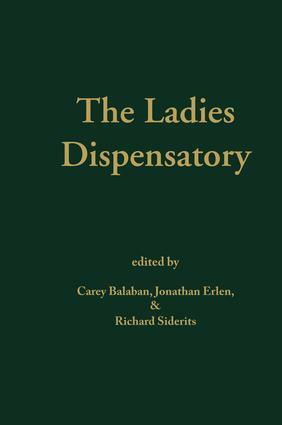 Balaban, Erlen and Siderits have resurrected Sowerby's original manuscript and have provided both historical and medical explanation of its uses and usefulness. From a common garlic remedy to 'fortify the brain' to 'a hog's heel, burned to powder' for easing colic, The Ladies' Dispensatory is a delightfully unique look at health and hygiene in the seventeenth century. Also inlcludes nine maps.